Capt. Steve - 24+ Years Experience guiding in Texas. Will work hard to put you on fish every time out. Licensed Professional Fishing Guide Service. Fine Boat & Quality Tackle Furnished. 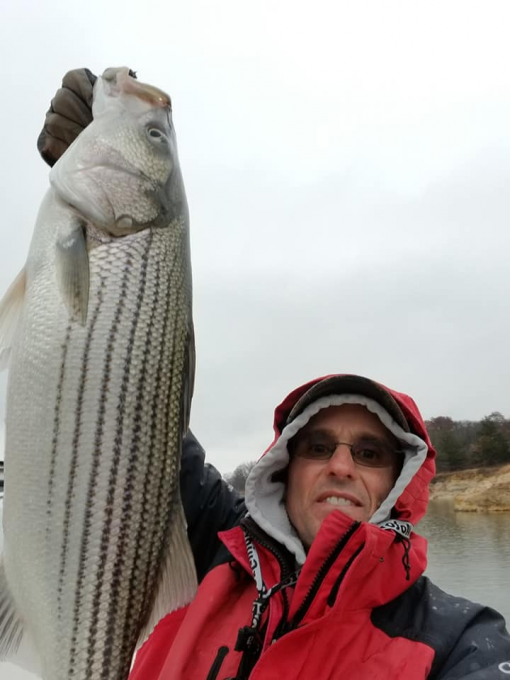 Winter is here on Lake Texoma. Fishing has been good with the recent warm spell but larger fish have been a little scarce. 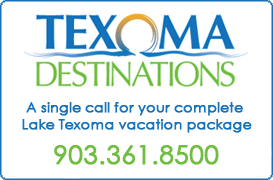 The colder winter temperatures with chances of rain (or even snow) turn the big fish on so fish the Winter season on Texoma. My cast nets are stored away till spring so we are fully committed to artificial baits for the next few months. Funny thing is I have more confidence in artificial baits over live bait during the colder months. My preferred method right now is deadsticking. Deadsticking is just what it sounds like. You drop a lure down to the fish and hold it still, only movement is the boat drifting wich should be about a half a mile per hour and not more than 1 mile per hour. Best lure is soft plastic fluke style bait on a 1 ounce jighead. Color can make some difference but as usual white, silver and chartreuse work best for me. I think the fish see contrast in color better than baits that are one color so if I have a chartreuse jighead I use a white or light colored fluke. White jighead I use chartreuse fluke. Look for birds working to point you to the active fish. If no birds are working sometimes you can drift a area where fish have been feeding and get them to gather up under you by splashing the water or beating on the side of the boat. Some days the open water fish just will not cooperate and you gotta get out the swimbaits or just cast the flukes on the rocky shorelines till you find some active fish. Good luck and if your interested in a deadsticking book a trip with me and I’ll teach you. With winter weather setting in, arms are sore from reeling them in, lots of good box fish and over 20″ fish. Caught a few deadsticking but tore them up casting swimbaits. Big fish are on the move. Either way I’m busting out the full winter gear and going fishing with or without customers, yes it’s that good.